On March 10-12, 2010, BizSugar took part in its first ever trade show as team members representing our small business social media and bookmarking community attended InfusionCon, a conference for users of e-mail marketing software InfusionSoft. By all accounts everyone had a blast and you can check out some of their reactions to the event which drew nearly 1000 visitors to the Montelucia resort in Scottsdale, Arizona. Those attending the event received a special BizSugar puzzle with their bag of goodies asking them to find 7 differences between the two specially designed sugar packets pictured on this page and then visit the BizSugar booth. There they were either interviewed for our YouTube Channel or given a special BizSugar tote bag plus had the opportunity to learn a bit more about the BizSugar community. 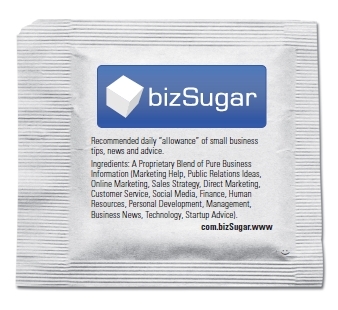 Can you find the 7 discrepancies between the two sugar packets above or on this PDF download of the BizSugar puzzle? Let us know in our comment section or via Twitter or our Facebook fan page. We’ll post the answers next week. See you then. 1. Missing black “bar” code in the upper right corner. 2. Missing TM (trader mark) sign. 6. Upper left corner is rounded off. 7. A subtle difference of the logotype and color scheme. Sweet 🙂 Fair play to Martin – I am useless at these and only got 5. Missed the TM and the left corner! Glad the show went well guys.